Jane Rushton was born on 27 April 1865 in Bromley, Poplar, Bow, London, Middlesex, England, at 11 Powis Road. She was known as Jennie. She arrived in the US with Johanna Brassel and Mary Ann Rushton and George Rushton on 13 June 1869 at the Port of Quebec, Quebec. Henry Hayes and Johanna Brassel appeared in the 4 April 1881 census of Canada in Niagara Falls (formerly Clifton), Welland County, Ontario, Canada. Other members of the household included Jane Rushton, Mary Ann Rushton, George Rushton, Henry Hayes, Hannah Hayes and Louise Hayes. "Johanna" is identified as Hannah Hayes, age 37. She married John Gorman, son of Thomas Gorman and Mary (? ), on 17 October 1894 in Niagara Falls Centre, Welland County, Ontario, Canada, at Hayes residence, Walnut [later McGrail] Street, Stamford Township. John Gorman and Jane Rushton appeared in the US federal census of 1 June 1900 in Niagara Falls, Niagara County, New York, at 715 Third Street. Other members of the household included Dorothy Edna Gorman. Jane Rushton became a widow at the 9 February 1901 death of her husband John Gorman. The following appeared on 9 February 1901 in the Daily Cataract Journal: After combating the ravages of an insidious disease for several months with a fortitude that was truly marvelous, John Gorman died at his home, 715 Third Street, at 10 o'clock this morning. The immediate cause of death was tuberculosis. Deceased was very well known in Niagara Falls and had a host of friends in the towns of Lewiston and Porter, who will learn with regret of his early demise. He was born in the village of Youngstown on May 10, 1870, and was consequently in his 31st year. As a youth he was generally beloved by his companions and all persons with whom he came in contact. He was educated in the public schools of Youngstown, and after leaving school was employed at various occupations until 1889, when he came to this city. For several years he worked for Fred E. Dean at the Linwood avenue market, and afterwards entered the employ of Louis F. Mayle of the Niagara Falls Brewing Company. On October 17, 1894, he was united in marriage to Miss Jennie Rushton of Niagara Falls, Ont., who is left to mourn her loss with a two years old daughter, Dorothy. Besides his wife and child, the deceased is survived by his parents, Mr. and Mrs. Thomas Gorman of Youngstown; four brothers, Timothy, Michael, Thomas J., and Patrick, who reside in Youngstown; also three sisters, Mrs. Minnie Hennessey of Willett's Point, New York Harbor, Miss Bessie and Miss Katie at Youngstown. The remains will be taken to Youngstown on Monday for burial, and the funeral will be held at St. Bernard's Catholic church in that village at 10 o'clock on Tuesday morning. Requiem high mass will be celebrated by Rev. Henry J. Dolan and the remains will be laid to rest in the family plot in St. Bernard's cemetery. Jane Rushton appeared in the 1905 Niagara Falls, New York, City Directory at 1810 Walnut Avenue at the same address as Peter Wilson..
Jane Rushton appeared in the Minnesota state census of 1 June 1905 in Niagara Falls, Niagara County, New York, at 734 Main Street living in the household of clothing merchant Max Amberg, where she was employed as a cook.. Her daughter Dorothy has yet to be found in the 1905 census. Dear Sister -- What do you think of this. hope you are feeling better. are having a grand time. all well, with love, Lou & Pete. Jane Rushton appeared in the US federal census of 15 April 1910 in Niagara Falls, Niagara County, New York, at 638 Main Street. She was housekeeper in the household of bank treasurer Felix Woolworth according to the 1910 census. In Johanna Brassel's will probated in the Surrogate Court, Welland County, Ontario, Canada, heirs included Jane Rushton and Henry Hayes, Hannah Hayes and Louise Hayes. Jane Rushton appeared in the US federal census of 1 January 1920 in Buffalo, Erie County, New York, at 623 Delaware Avenue. She was housekeeper in the household of bank vice-president Felix Woolworth, according to the 1920 census. Jane Rushton appeared in the US federal census of 1 April 1930 in Buffalo, Erie County, New York, at 100 Norwood Avenue. She was housekeeper in the household of Paulding Sellers, vice president of Buffalo General Electric, according to the 1930 census. Louise Hayes Wilson and her sister Jennie Rushton Gorman were photographed on laundry day. 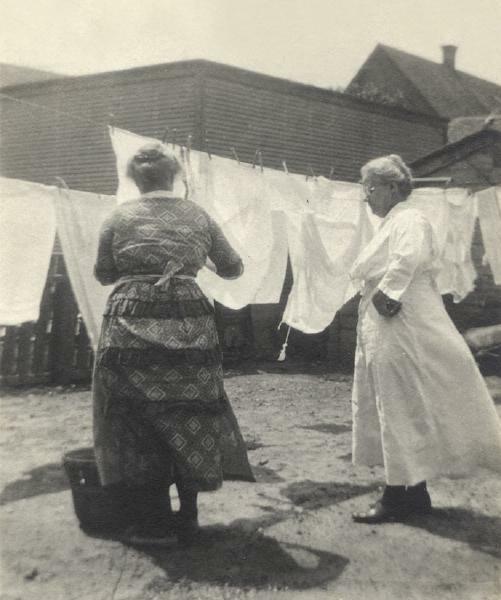 Louise Hayes Wilson and sister Jenny Rushton Gorman on laundry day. Francis Bernard Ingraham and Dorothy Edna Gorman appeared in the US federal census of 1 April 1940 in Niagara Falls, Niagara County, New York, at 2461 Linwood Avenue. Other members of the household included Jane Rushton, Raymond Eugene Ingraham. The following appeared on 21 January 1941 in the Niagara Falls Gazette: Harry Hayes, 65, a retired silver-plater of the Rogers Silverware corporation, died yesterday afternoon at Memorial hospital. He is survived by two sisters, Mrs. Peter M. Wilson and Mrs. Jennie Gorman, both of this city. Funeral services will be held from the Hardison and Beatty funeral home tomorrow afternoon at 2 o'clock, with the Rev. David Henry Weeks officiating. Interment will be in All Saints cemetery, Niagara Falls, Ont. Jane Rushton died on 12 January 1947 at age 81 in Niagara Falls, Niagara County, New York, at 336 7th Street the residence of her sister Louise. . Hier death was officially witnessed by George Aldous Rushton. She was interred at Niagara Falls Memorial Park Cemetery, Lewiston, Niagara County, New York. The following appeared in the Niagara Falls Gazette: [Died] In this city, January 12, 1947, Jennie Gorman, age 82; sister of Mrs. Peter M. Wilson and George Rushton Sr. She is also survived by one grand son, Raymond Ingraham. Funeral at Gridley Funeral Home, 750 Main St., Wednesday at 2:30, Rev. Blake Hammond officiating. Interment in Memorial Park cemetery.